When our children are at school, we trust that the area around them is safe. However, playground injuries are much more common than one may think. According to the Centers for Disease Control and Prevention (CDC), each year hospitals treat more than 200,000 ages 14 and younger for injuries sustained on the playground. Furthermore, approximately 45 percent of those child injuries are severe, including fractures, concussions, brain injuries, dislocations and internal injuries. 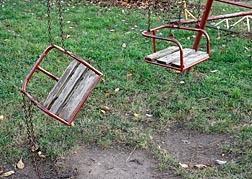 Sadly, around 15 children die each year as a result of injuries sustained on the playground. The CPSC (FIND NAME) received reports of 147 deaths involving children under age 15 in a 10 year period. Over half of those deaths involved hanging, with other causes of death including falls, equipment tipover, equipment collapse and impact with moving parts. People who design and maintain public playgrounds have an obligation to ensure that the playgrounds are as safe as possible. This means making sure that the equipment is not defective and will not tip over or collapse, ensuring that all ropes are safe for use and putting a protective surface underneath playground equipment in case of a fall. The Killino Firm is concerned with making sure that our children are safe while they play. That is why we filed a nationwide class action lawsuit against Mattel to force the toy maker to pay for the testing of children who were at risk of lead poisoning from its products. In 2007, Mattel recalled 1.5 million toys after it was discovered that they contained lead paint, which is toxic and can cause irreversible brain damage and other injuries in children. At The Killino Firm, we fight so that children can be kept safe from companies or people that want to save a few pennies but in the process put children’s lives at risk. We represent the children of families across the United States. When you need a lawyer who will exhaustively investigate a playground injury and make sure that every responsible party is held accountable, contact The Killino Firm, where Keeping America Safe is our primary goal. To speak to one of our attorneys, please fill out the form on this page, call toll free at 877-875-2927, or send an email to one of our personal injury attorneys today. We will respond promptly to your inquiry so that you can experience The Killino Firm Difference.